IN 1959, KEN Kesey, a graduate student in creative writing at Stanford University, volunteered to take part in a government drug research program at Menlo Park Veterans Hospital that tested a variety of psychoactive drugs such as LSD, which was legal at the time, psilocybin, mescaline, and amphetamine IT-290. 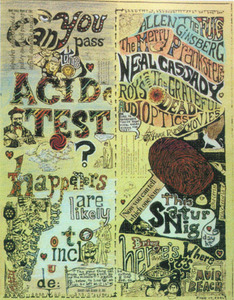 Over a period of several weeks, Kesey ingested these hallucinogens and wrote of his drug-induced experiences for government researchers. From this experience, Kesey wrote his most celebrated novel, One Flew Over The Cuckoo's Nest, and began his own experimentations with psychedelic drugs. His goal was to break through conformist thought and ultimately forge a reconfiguration of American society. In the early 1960s, Neal Cassady showed up to meet the famous author and became the most celebrated member of Kesey's fledgling group, the Merry Pranksters. 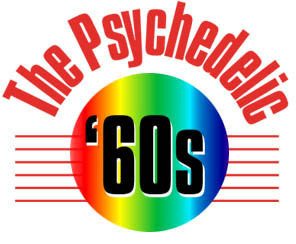 Much of the hippie aesthetic that would dawn on the San Francisco scene in the late sixties can be traced back to the Merry Pranksters who openly used psychoactive drugs, wore outrageous attire, performed bizarre acts of street theater, and engaged in peaceful confrontation with not only the laws of conformity, but with the mores of conventionality. As Kesey put it: "What we hoped was that we could stop the coming end of the world." By 1966, when Kesey had been apprehended as a fugitive from the law, he denounced the curative powers of LSD as temporary and delusional, but nothing he said could stop the psychedelic era that was about to explode in San Francisco. Ken Kesey. One Flew Over The Cuckoo¹s Nest. New York: Viking Press, 1962. ONE FLEW OVER The Cuckoo's Nest was an immediate critical and commercial success. It was read as a compelling cautionary tale that viewed society, represented by Big Nurse, as a cold, formidable negation of all that is free, lusty and nonconformist. McMurphy, a malingerer from a penal work farm, tries to rekindle a spark of life among his fellow patients, and is thwarted at each step by the cold, calculating Nurse Ratched, who ultimately curtails McMurphy's free wheeling ways by subjecting him to a lobotomy. From this book, Kesey gained the notoriety and the income necessary to draw together his motley band of Merry Pranksters, who through their many antics and travels, set the stage for the Psychedelic Era that was to follow. 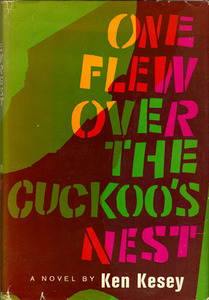 A critically acclaimed novel that is still taught at universities today, One Flew Over The Cuckoo's Nest remains Ken Kesey's most popular work. From Paul Grushkin, The Art of Rock : Posters from Presley to Punk. WITH THE COMMERCIAL success of One Flew Over The Cuckoo's Nest, Kesey bought property in La Honda and moved his wife and children and assorted Merry Pranksters to the mountains outside of San Francisco. 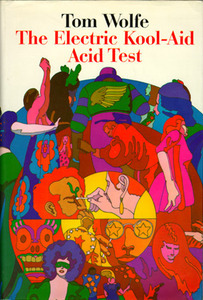 There they began throwing parties Kesey called Acid Tests, where revelers would ingest LSD, sometimes without their knowledge, and attempt to survive the often harrowing night. Kesey believed that one's personal fears should be confronted under the influence of hallucinogenic drugs. The surrounding woods, with trees painted day-glo colors, dissonant music blasting from hidden speakers, and the very odd invited guests, ­including members of the Hell's Angels, ­made the parties an experience that not all endured without physical and psychological consequences. Kesey constantly pushed the limits with his own experimentations and eventually moved the Acid Tests into public places such as the Longshoreman's Hall, Muir Beach, or musical events at Bill Graham's Fillmore West. From uncorrected proof of Ken Kesey, The Further Inquiry. 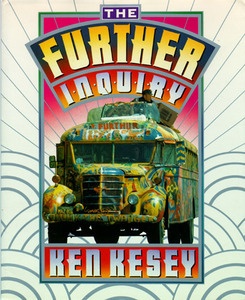 THE PUBLICATION OF Kesey's second novel Sometimes a Great Notion demanded his presence in New York, so Kesey bought a 1939 International Harvester school bus that he and the Merry Pranksters painted in day-glo colors, and outfitted it for a cross-country trip. With Neal Cassady at the wheel, they left La Honda in June 1964 and began their now legendary journey across the country, smoking marijuana, and dropping acid along the way. The top of the bus was made into a musical stage and when it detoured through some cities, the Pranksters blasted a combination of crude homemade music and running commentary to all the astonished onlookers. They arrived in New York in July after an arduous journey, whereupon Neal Cassady introduced them to Allen Ginsberg and Jack Kerouac. Ginsberg embraced the new legends immediately and arranged for them to drive to Millbrook to meet the other psychedelic pioneer, Timothy Leary. Jack Kerouac was not impressed and had little to say to either Kesey or the Merry Pranksters. Shown is an image of the famous bus on its journey across the United States. Tom Wolfe. The Electric Kool-Aid Acid Test. New York: Farrar, Straus, and Giroux, 1968. TOM WOLFE DID not catch up with Ken Kesey and the Merry Pranksters until their long, strange journey was almost at an end. He met the elusive leader of the Merry Pranksters at the San Mateo county jail where Kesey ended up following his faked suicide and subsequent exile to Mexico. The psychedelic movement was just about to explode onto the world stage, and it was Kesey and his Pranksters who originated nearly every aspect of the new 'hippie' aesthetic­: bizarre dress, communal lifestyle, psychedelic drugs, light shows, and self-expressive rock and roll music. Tom Wolfe's breakneck, frenetic style captured the wild and turbulent years when the Merry Pranksters rambled across the country and back, hiding out in Mexico, and staging some of the most outrageous public events ever conceived. Hunter S. Thompson. Hell's Angels. 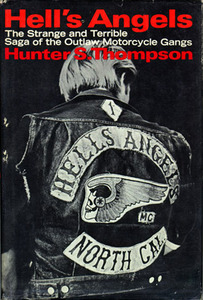 FREELANCE JOURNALIST HUNTER S. Thompson introduced Kesey to a group of Hell's Angels in July 1965. The Hell's Angels were as impressed with Kesey as he was with them, and in August Kesey hosted his first Acid Test with the Angels at his home in La Honda. Thompson believed it would be a disastrous mix­, the Angels had never taken LSD, but after a night of wild revelry that approached insanity at times, the Hell's Angels rode away peacefully the following morning. The Merry Pranksters and the Hell's Angels would participate in numerous events together over the next two years. Thompson continued his close association with a group of Angels to gather material for his book, but he parted company suddenly in September 1966 when several members, some of whom he considered friends, turned on him and nearly beat him to death. Ken Babbs and Paul Berry. On The Bus. New York: Thunder's Mouth Press, 1996. "YOU'RE EITHER ON the bus, or you're off the bus," became the metaphor for the Merry Pranksters and was repeated endlessly (you had to be there) on the long and now famous cross-country journey in the psychedelic bus, Furthur. After picking up Allen Ginsberg in New York City, they headed to Millbrook, New York to pay a visit to the other early promoter of LSD, Timothy Leary. Leary had set up the Castalia Foundation to explore the psychological and spiritual complexities of LSD use, and the Institute was located on the grounds of a mansion owned by William Hitchcock, a colleague of Leary's at Harvard. The Prankster Bus rolled up the long driveway unannounced, the Pranksters throwing green smoke bombs from the roof, blasting their crude music, and shouting from the windows. The visit was not the communal success Kesey had imagined. Leary briefly met the Pranksters, sat on the bus for a few minutes, and then retired to his room. The following day, the bus roared off and headed west. 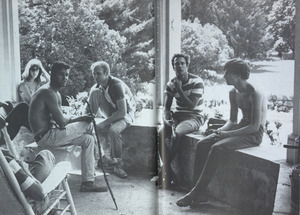 Shown is a picture of the Merry Pranksters on the porch at the Millbrook Mansion.